Los Zocos Club Resort Free Child Places, Costa Teguise, Lanzarote family Holidays @Web2travelDeals. Online Since 2000. Still finding the Best Value All Inclusive Holidays to Lanzarote from UK airports. The 4 Los Zocos Club Resort is a great choice for Family Holidays in Lanzarote, as it’s only 5 minutes walk from the sandy Las Cuchara Beach, and close to two other beaches. Walk around the 15 acres of Los Zocos and you’ll find two swimming pools, two buffet restaurants, and three bars. Free Wi-Fi zones and a kids club from May to October. Free Child Places Costa Teguise Now Available for 2020. Get More Information and claim your Free Child Place at Los Zocos Club Resort. 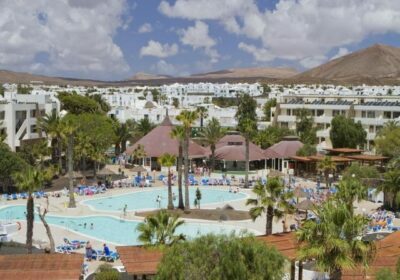 Previously known as Los Zocos Aparthotel, Los Zocos Club Resort, Costa Teguise, Lanzarote is a family resort during the school holidays but also an ideal base for a couple. The rooms are very clean (cleaned 5 days a week), comfortable. Staff are very friendly and speak English. The pool area is very popular and can be very busy from the early hours in the rush for families to grab the sunbeds. 14 nts All Inclusive from £521.45 including flights from Birmingham Depart 27th August. Based on family of 4 sharing 1 bedroom apartment. Studios, 1 bedroom and 2 bedroom apartments are available so plenty or room to accomodate the family. All Inclusive is available with a good choice of very good food. 5 minutes walk to the beach, shops, supermarkets and restaurants. Activities are available for all ages, and resort is very family orientated. If you want a holday with short airport transfers, Costa Teguise is in an ideal location 15 mins from Lanzarote airport, but not under flight path. Car hire can be very cheap and as its easy to drive around this small island in the Canaries, it is recommended that you take advantage of this to experience the volcanic landscape. The Los Zocos Club Resort is ideally situated close to the beach and local amenities. The complex is an ideal choice for families and couples seeking a fun and relaxing holiday. The facilities provided for guests at Los Zocos includes a 24 hour reception, currency exchange, Internet access, games and TV room. The complex offers 3 swimming pools, sun terraces with loungers, 2 tennis courts, football pitch, beach volleyball court, shooting and archery, mini golf, pool games & activities and aerobics. For the younger guests there are 2 paddling pools, mini club with games and activities, mini disco and playground. Within the complex there is a buffet restaurant and a poolside snack and beverage bar. “El boulevard” is a large marquee also within the complex grounds which has a Chinese buffet restaurant, a pizzeria buffet and a grill steak house. There is also a cocktail bar which has live music every evening. The apartments are either one or two bedroom and all feature safety deposit box, direct dial telephone, television, kitchen (with fridge and oven), private bathroom and terrace.